KIEV - What is a tight end? That is the prickly question a growing number of Ukrainians are asking as American football slowly makes its impact on the crisis-torn former Soviet republic now forging an ever-closer alliance with the West. The US National Football League (NFL) -- one of the world's richest sports organisations and a big proponent of expanding into European countries such as England -- has never set its sights on impoverished Ukraine. The east European country has been ravaged by a Russia-backed war in its east that has claimed more than 10,000 lives and is just now digging itself out of a dire economic recession. But this has not kept Ukrainians from launching an amateur league whose total budget is easily eclipsed by the annual salaries of US football superstars such as the New England Patriots' quarterback Tom Brady. "Our biggest problem is financing," the Ukrainian capital's Kyiv Rebels coach Artem Ryaboshapka told AFP. "We have problems travelling for away games because renting a bus costs 36,000 hryvnias ($1,400, 1,200 euros) for one trip," Ryaboshapka said. Such a tiny price tag might make some US football players accustomed to staying in five-star hotels blush. But it makes Ryaboshapka's Kyiv Rebels and the other 17 teams competing in the three-year-old Ukrainian league come up with ingenious ways to keep the US sport alive. The lack of particular interest from sponsors means the bitter rivals on the field organise joint training sessions to which the entire league shows up. Some US expats are also ready to lend a helping hand. 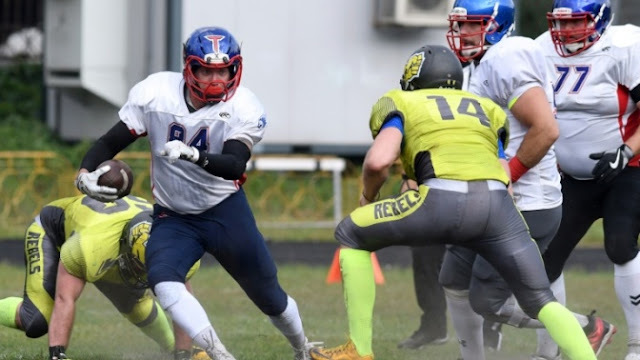 Several Americans working in Ukraine have assumed the unpaid role of teaching players and fans alike how exactly the gridiron sport is played. "We have a lot of great athletes here but they need a lot of coaching up," Washington native Alphey Williams said. "No one is getting paid. They are doing it for fun. They are doing it because they love it." Rebels coach Ryaboshapka said one of the most vexing obstacles he has encountered is that "when people asked what American football is, they say 'rugby'." The Soviet Union played some rugby and the sport's egg-shaped ball is at least slightly more familiar to many here than its slimmer US counterpart. "People are often not even aware of the basic differences between American football and rugby," Ryaboshapka complained. The Rebels have not found much success as they prepare for their very first season in the league. They recently lost a friendly to a team from Estonia -- a tiny Baltic state where US football is also a complete novelty -- during a preseason game attended by just a few dozen fans in Kiev. But the Rebels' co-founder Andriy Kravchenko said the game is an increasingly popular hobby for players that has plenty of potential to grow. "Our team, like all American football in Ukraine, now looks better than last year. I hope that this trend will continue," the 42-year-old IT-specialist by profession told AFP. "This is a first season. We will draw conclusions, and the next match against (the Estonian team will be completely different," Kravchenko said dressed in the Rebels' yellow jersey with number 76 on its back. And he has an answer for the uninitiated to the game: a tight end is an offensive player with the dual role of protecting the quarterback -- the guy who passes the ball downfield -- and also making catches on specially designed plays.